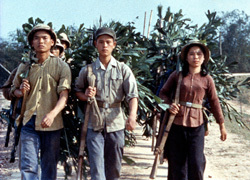 The film is thus both a fascinating piece of artfully made agitprop and an unflinching view of the Vietnam War that presented aspects of the conflict that weren’t covered by the mainstream media in this country until several years later. The film has been out of distribution in the U.S. for years; this DVD release from Icarus Films represents its first appearance on any home-entertainment format on these shores. The filmmakers use a variety of approaches to convey their messages: cinema verite, raw combat footage, direct address from the director to the audience, the “essay” format, a fictional interlude, manipulated TV broadcasts, and even animation. The only difficulty the film presents to the diehard film buff is determining which filmmaker made what, as only two directors are identified in their segments. Chris Marker (Le Joli Mai) served as the “organizer” of the project. Marker biographers contend that he shot no new footage for the picture, but his touch can be felt throughout in the editing and the narration. Dutch filmmaker Joris Ivens is identified in the narration as having shot a segment about bomb shelters being made by the Vietnamese (he also supplied other footage shot in Hanoi, including a performance mocking President Johnson). The film’s fictional segment — in which an “engaged” intellectual (Bernand Fresson) discusses the war with his impassive girlfriend — is the work of the great Alain Resnais (Wild Grass) and scripter Jacques Sternberg. The American photographer-turned-filmmaker William Klein (Mr. Freedom) shot some of the film’s most kinetic segments: a candid interview with Fidel Castro; grimly playful alterations of idyllic magazines photos; and emotionally charged footage shot on the streets of the NYC of pro- and anti-war rallies. The one director who breaks the collective pledge of anonymity is Jean-Luc Godard (Weekend), who speaks directly to the viewer in his 11-minute segment, musing about the war. 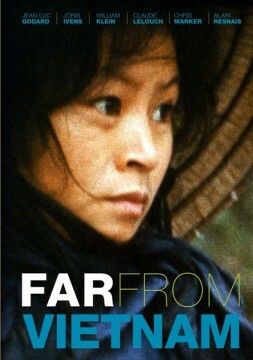 Though his contribution is wildly different from the rest of the film, as it plays like a diary entry rather than an essay or a piece of journalism, it perhaps the most brutally honest segment, as he openly discusses the role (and duties) of the filmmaker, and the skeptical response of the Vietnamese to shows of solidarity from filmmakers like himself — easily understood, given the former occupational presence of France in the country. Far From Vietnam infuriated critics upon its release here in 1968. 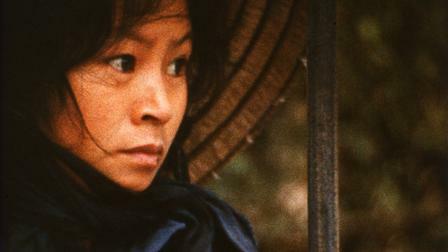 The film received not one but two negative notices in The New York Times. Renata Adler deemed the picture “facile and slipshod and stereotyped,” while Bosley Crowther opined that it was a “scurrilous” piece of filmmaking. While some of the film’s more doctrinaire moments are best viewed as history lessons, Godard’s filmic “confession” and Klein’s protest footage make the film an invaluable, compelling slice of history. Klein perfectly captured the impassioned feelings on both sides, with a pro-war crowd loudly yelling “BOMB HANOI!” in unison down in the Wall Street area, while an anti-war African-American protester talks about the “capitalist pimps” who are responsible for the conflict.